As first attempts go, the Creative Sound BlasterX Vanguard K08 gaming keyboard has some high and low points. While the Vanguard has excellent lighting and an alternative key action, are these differences enough to carve out a slice of what is a very competitive sector? There was a time, long ago, when Creative exclusively made sound cards and other audio related tech. Being quite so niche these days isn’t realistic, and they now offer a selection of PC peripherals under their Sound BlasterX branding umbrella. 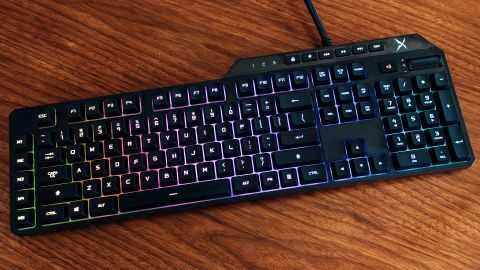 The new Vanguard K08 gaming keyboard is a classic example of Creative’s mission creep, as it impinges on the well-occupied territory of SteelSeries, Razer, Cougar and Corsair, among others. These companies are mostly rehashing the Cherry MX range of mechanical switches, a very popular choice for serious gamers. With the Vanguard K08, Creative has chosen to go down an alternate path with Omron switches and deliver something noticeably different to the discerning gamer. For $139 (£159, AU$219), this gaming keyboard offers plenty of plucky performance with quiet mechanical switches that's fully customizable. It isn’t clear when this became a prerequisite, but all modern gaming keyboards look like they are evolving into fairground attractions. This is despite the indisputable fact that most gamers playing without looking at their keyboard - unless they're new to computers. The Vanguard K08 embraces this aesthetic, with an ‘Aurora Reactive’ lighting scheme that allows the user to define all manner of funky lighting effects with 16 million color possibilities . For peripheral lighting, the K08 has one of the slickest implementations so far. Offering a vast selection of presets and customisations available through the Sound Blaster Connect app. The software isn’t provided out of the box, so those wanting to alter the default rainbow light show or define keyboard macros will need to download it from Creative first. All alterations are stored onto the keyboard's own internal memory, allowing them to travel without the app to other computers. As for the layout, there’s nothing especially radical to see here. The review model had a standard US layout, with five user-definable function keys down the left, and six media controls arranged on the top right. Above the numeric pad are a mute key and a roller to control audio volume. The excessively thick braided cable exits the keyboard case at the top right, then splits into two Type A USB connectors at the end of a two meter run. One of these drives the keyboard and lights, and the other delivers a USB 2.0 pass-through providing a single port, intended mostly for mouse use. Overall, the keyboard is well constructed, with a significant amount of force needed to generate any flexing. The two retractable feet positioned at the rear can increase the shallow rake when deployed. The only other notable hardware feature is the wrist rest, which is made almost entirely from plastic. It doesn’t permanently attach to the K08, and is only held in place by thin plastic prongs trapped under the front edge of the keyboard. Therefore, if you pick up the keyboard, the wrist rest won’t be coming along with it. The lighting is fun, but what will make a significantly greater impact are the switches on the K08, as those are revolutionary. Omron are better known for their mouse button switches, but they also designed the special PRES. (Perceive-React-Execute Switch) used in the K08. The selling points of PRES switches are that although the switch has a good travel distance (3.5mm), reducing finger joint impacts, they activate after just 1.5mm of movement. The actuation point isn't so short that lightly brushing keys generate an unintentional press, but enough that it doesn’t take the full travel of the keys to fire. The logic here is that should you start pressing at the same exact moment as your Cherry MX opposition, then your key will register first, assuming you experience the same level of lag. The actuation force is 45g, and the PRES switch is rated for a 70 million actions, should your fingers not fall off long before hitting that number. Part of PRES switch proposition is the ability to use the same keyboard for both typing at speed and gaming without compromising either is highly desirable to many users. Testing it with Nier: Automata where button mashing is necessary, we found zero to no latency and the keyboard also kept up with our commands with precision. Playing Hellblade: Senua’s Sacrifice, where timed attacks and blocks are essential to the game play, we found its execution to be near perfect. Another positive aspect of the switches is that they’re relatively quiet, unlike the popular and thunderous HyperX Alloy Elite. For late night gamers, that aspect could be a deal-maker, even if the K08 isn’t close to being silent. One issue we ran into was that the five custom side keys are very close to the main keyboard, and are so close that our hands kept registering them as a left edge boundary. This unconscious reference caused the M4 key to be repeatedly struck instead of the intended left shift. While most users will eventually adapt, that transition isn’t likely to be overnight. If this weren't the first gaming keyboard to carry the Sound BlasterX branding, we’d be more critical. But, as a first attempts go, the Vanguard K08 is an impressive if slightly flawed one. The Omron PRES switches are different from an MX, but not so much that it will put gamers off. Equally, the Aurora lighting technology has an immediate impact, through how many buyers will turn it off as a distraction over time is debatable. The biggest issue is pricing, as it is on the high side to our sensibilities. A Logitech G610 cost less, and it's made to an equivalent or better specification than the Vanguard M08. Another bugbear is the overly thick and stiff USB cable. While having a USB pass-through is convenient, a cable that won’t naturally lay flat on a desk isn't. But price tag notwithstanding, it’s a great option and an impressive first attempt. The quality and performance shows the team behind this keyboard can make truly excellent gaming peripherals, should they get subsequent designs green lit.